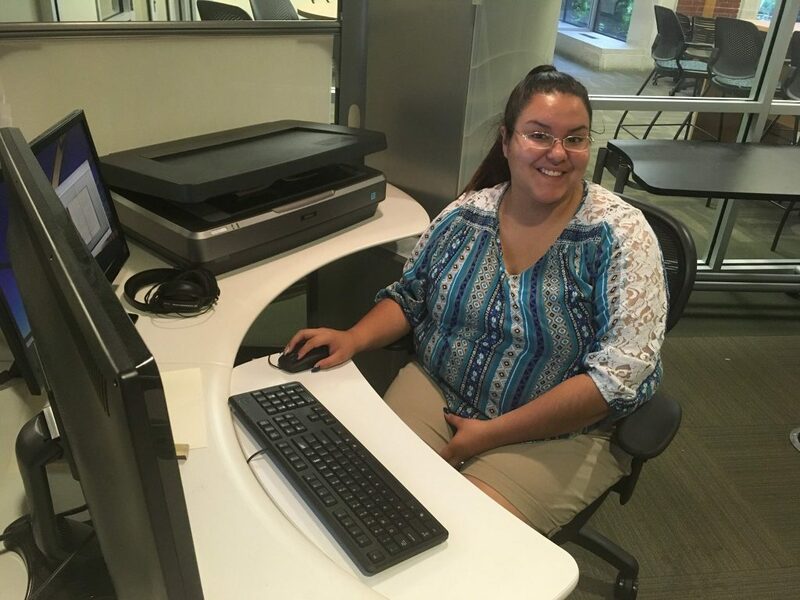 This fresh-faced young lady is Gabriella “Gabby” Hernandez, a rising senior at Waco ISD’s University High School (home of the Trojans) and our 2017 Prosper Waco summer intern here at the Baylor University Libraries! Gabby spent 80 hours with us over the course of June and July getting experience in the work we do here in the Digital Projects Group, and today we’re highlighting her end-of-internship project. This year, the DPG agreed to host the Prosper Waco intern, and from the start we knew we’d struck gold with Gabby. She is unfailingly polite, punctual and positive. Every task we gave her – from the mundane, like organizing stacks of old newspapers, to the innovative – she handled with attention to detail and politeness. In short: we were thrilled with the quality of Gabby’s work during her time in the Riley Digitization Center. After some conversations and giving Gabby time to explore our Digital Collections, we hit on the idea of challenging Gabby to take items from the collections and turn them into learning tools – like hands-on manipulatives (puzzles, matching games), songs, art projects and more – for kids ages one to five. Gabby came up with eight examples using materials from the Digital Collections, including a coloring sheet, a matching game and an early literacy evaluation tool. Another component of Gabby’s time with us was introducing her to the WordPress suite of tools. She expressed an interest in setting up a website for her post-school business, and we thought a WordPress blog offered a good introduction to both desktop publishing and entrepreneurial enterprise. So she reserved a URL (https://gabriellahernandezweb.wordpress.com/) and set up her first blog, with a post about her experiences with us this summer and another detailing her plans for creating lesson plans using Digital Collections materials. We won’t spoil her stories here, so we’ll encourage you to head over to Gabby’s blog to read the thoughts and experiences of a 17-year-old budding businesswoman in her own words. Our time with Gabby was short but certainly sweet, and it was a positive experience for all involved. We exposed her to new technologies, helped her develop skills and materials for her future job and we benefited from having the energy and insight of a high school student around the office. That’s one busy summer! From all of us at the RDC to Gabby and all her fellow Prosper Waco interns, we wish you great success as you enter your senior year and SIC ‘EM! You can view Gabby’s blog at https://gabriellahernandezweb.wordpress.com/. Read her post on lesson plans here, and her post on her experience in the RDC here.